The Sony A7 is the world's first 35mm full-frame compact system camera (along with the A7R that was launched at the same time). The Sony A7 has a 24.3 megapixel full-frame sensor with an optical low-pass filter, a Sony E bayonet mount, a new range of full-frame E-mount lenses, a dust/moisture-resistant magnesium alloy body, ISO range of 50-51200, fast hybrid auto focus system, XGA OLED electronic viewfinder, tiltable 3-inch LCD screen, NFC and Wi-Fi connectivity, Full 60p/24p HD movie recording and 4K photo output for viewing on Ultra HD displays and TVs. The Sony A7 is available now priced at around £1299 / $1699 body only or £1549 / $1999 with the Sony FE 28-70mm f3.5-5.6 OSS kit lens. The A7 is virtually identical to the A7R that we reviewed yesterday in terms of appearance and features, so a lot of the comments that we made about that camera will be repeated here. Following in the footsteps of last year's Cyber-shot RX1 and RX1R models, which offered a full-frame sensor in a compact camera body, the new A7 and A7R now bring 35mm full-frame to the world of interchangeable lens compact system cameras. Full-frame 35mm image sensors have always been associated with complicated, bulky DSLRs, but that has now completely changed with the arrival of the Sony A7 and A7R. These two cameras are the same size as CSCs' like the Olympus OM-D E-M1 and Fujifilm X-E2, yet offer a sensor that's as big as those in DSLRs like the Nikon D800, D600, Canon EOS 5D Mark II, 6D and Sony's own A99. In short, the Sony A7 and A7R are currently the only cameras in the world that offer such a large sensor in such a small body. On paper at least the Sony A7 offers almost everything that the experienced photographer could want - a 35mm CMOS sensor, interchangeable lenses, an OLED electronic viewfinder, a large and high-resolution LCD screen, full control over exposure via a variety of external controls, and 14-bit Raw file format support, all housed inside a compact and lightweight body that you can just about squeeze into a jacket pocket without a lens attached. Compared to a DSLR, the only notable thing that's really missing is a built-in pop-up flash. Despite its large image sensor, the aluminium bodied Sony A7 is still quite small and slender, measuring just over 4.5cms in depth, 9.5cms in height and 12.7cms in width, and weighing 416g (9g more than the A7R) without a lens, battery and memory card fitted. Despite being fractionally lighter, the A7R actually has more magnesium alloy in its build, making it feel slightly better built than the cheaper A7. There's a generously sized textured area for gripping the camera on the front with three fingers, and a large thumb-shaped lozenge on the rear, which makes the A7 easy to literally get to grips with, important as the rest of its aluminum body is very smooth. Located on the minimalist front of the A7 is the lens mount and a small porthole on the left for the self-timer/AF illuminator, plus the front control dial which is set into the top of the handgrip. The A7 and A7R both use the E bayonet mount, but because the image sensor is so large, putting an E-mount lens on these cameras will cause varying amounts of vignetting (which could be removed in post-processing) or an APS-C crop, which given the amount of megapixels on offer isn't the end of the world. You can also use Sony's range of A-mount lenses by fitting the LA-E4 adapter, but that adds extra bulk and expense to the overall package. So Sony have also launched a new range of lenses with the "FE" name, denoting "full-frame E-mount ", with five lenses announced at the same time as the A7/A7R bodies. Somewhat confusingly, though, only two lenses are actually available at launch, the Sony 28-70mm F3.5-5.6 OSS which only ships as a kit lens with the A7, and the Carl Zeiss Sonnar T* 35mm F2.8. We were sent the Carl Zeiss Sonnar T* 55mm F1.8 for review with the A7, which isn't actually in the shops until January next year. The other two FE lenses that will be available are the Carl Zeiss Vario-Tessar T* 24-70mm F4 ZA OSS (January 2014) and the G Lens 70-200mm F4 OSS (availability still unknown at time of writing). 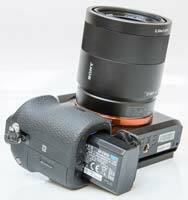 In addition, the Sony A7/A7R can be used with a wide variety of third-party lenses by buying and fitting a suitable adapter. On top the A7 has an external hotshoe, dubbed the Multi Interface Shoe, for attaching one of a range of accessories, including an external flash. Thanks to its electronic front curtain shutter, the A7 has a faster sync speed of 1/250th sec, compared to the A7R's 1/160th sec, making it better suited to flash-based portrait photography. 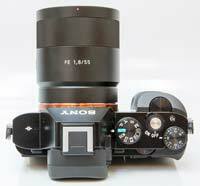 Turn the On/Off switch on the top plate and the Sony A7 readies itself for action in a just over a second. The adequately sized shutter-release button has a definite halfway point, determining focus and exposure with a bleep of affirmation and focus points highlighted as green rectangles on the LCD. Note that wehn you do fire the shutter, it emits a rather loud mechanical sound.. The A7 has a loud shutter action, but it's still quieter than the even louder A7R, which doesn't have an electronic front curtain shutter like the A7. Neither camera is particularly well-suited to more candid moments though. The A7 uses a hybrid AF system which employs both phase-detection and contrast-based auto-focusing, which should be the equal of the phase-detection systems that DSLRs typically use. On paper at least, the A7 clearly has the technological edge here over the A7R, as the hybrid AF system offers 117 phase-detection points and 25 contrast-detection points, while the A7R only has contrast-detection AF with 25 points. In the real world, though, while it's clear using the cameras side-by-side that the A7 is definitely faster to auto-focus than the A7R, the difference isn't as big as you would expect. The A7 still takes a little longer than we'd like to lock onto the subject compared to a comparable DSLR or a class-leading compact system camera like the Olympus OM-D E-M1. The A7 and A7R are close enough together in this regard that we wouldn't recommend choosing one over the other based purely on focusing speed. When you choose to manually focus, a distance scale is displayed along the bottom of the LCD screen, MF Assist can be turned on to magnify the image and help you get sharp results, and there's also the same convenient Peaking function from Sony's DSLRs that highlights sharply-focused areas of the image on the LCD screen. Go on to take the shot and JPEG or Raw images are quickly committed to memory in a single second, the screen momentarily blanking out and then displaying the captured image before the user can go on to take a second shot. A round shooting mode dial with a knurled edge and positive action is also located on top of the camera. This lets you quickly switch between the various shooting modes that are on offer. Sony has included Intelligent Auto scene recognition, which works in virtually identical fashion to the intelligent auto modes of Panasonic's and Canon's compact ranges. Simply point the A7 at a scene or subject and the camera analyses it and automatically chooses one of a number of pre-optimised settings to best suit. 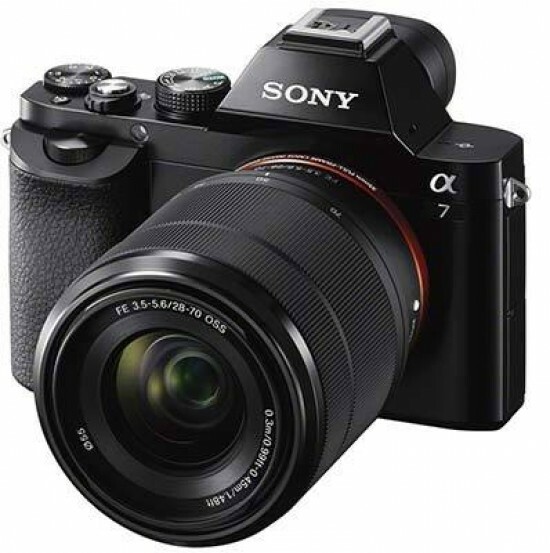 Adding to the A7's snapshot simplicity, these features accompany face recognition and smile shutter functionality on board, the former mode biasing human faces in the frame and the latter mode firing the shutter when it detects a smiling subject. The Face Detection system automatically adjusts the focus, exposure and white balance for people in the frame, and can even be set to distinguish between children and adults. Smile Detection offers three self-explanatory options, Big, Normal and Slight. Used in conjunction, the Face and Smile Detection systems do result in more hits than misses, especially in contrasty lighting conditions, although all those smiling faces could ultimately freak you out a little! The self-portrait options in the self-timer menu work by automatically taking the shot with a two second delay after either one or two people have entered the frame. In addition to the regular Program mode, which provides the full range of camera options and additionally allows you to change settings like the ISO speed and metering, is the welcome inclusion of Aperture-priority, Shutter-priority and fully Manual modes which let you independently set the aperture and shutter speed, making the A7 instantly appeal to the more experienced photographer. The ability to choose from 30-1/8000th second shutter speeds opens up a lot of creative potential. There's also very welcome support for the RAW file format, which is really the icing on the cake for serious photographers. Two Custom modes on the shooting mode dial allow you quickly access different combinations of settings. In the clever Hand-held Twilight and Anti Motion Blur scene modes, the A7 takes six shots in a rapid sequence, typically at a high sensitivity setting and a (relatively) fast shutter speed, and then combines them into a single image that has somewhat less noise than a single shot taken at the same ISO and exposure settings. In our experience, the difference between the two modes is that in Anti Motion Blur mode, the camera is more willing to pick a really high ISO setting like ISO 6400 to maintain a fast shutter speed, whereas in Hand-held Twilight mode, it will only go as high as absolutely necessary to avoid camera shake at the chosen focal length. 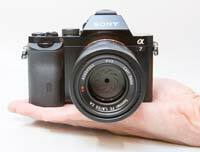 If light levels are truly low, however, the A7 will pick a high ISO speed even in this mode. Present and correct is the increasingly ubiquitous ability to shoot High Definition video clips. The A7 does so at full 1080p HD rather than 1080i or 720p, and also with stereo sound rather than mono. The various options are 1920x1280 pixels at 60p/50p/60i/50i or 25p/24p in the AVCHD format, and 1440x1280 or 640x480 pixels at 30fps in the MPEG4 format. There's the ability to change the EV level, white balance, metering, ISO speed, DRO/HDR, creative style and picture effect, plus various audio recording options. If you set the shooting mode dial to Movie, you can also choose from Program, Aperture or Shutter priority and Manual modes, giving you full control over exposure for both stills and movies. There's also a clean HDMI output from the camera, whichallows video to be viewed on an external monitor or recorded on another device. High-resolution still images can be displayed directly on a 4K television, offering four times the detail of Full HD. The small dedicated Movie button on the rear of the A7 allows you to start recording a movie with a single push of a button, and then stop recording by pressing the same button - a lot more intuitive than having to select the movie mode then press the shutter button, as on most compacts. The Sony A7 can shoot full-resolution 24 megapixel pictures at up to 5fps, quite a fast rate for a 35mm full-frame camera. To achieve the full 5fps you need to set the drive mode to the Speed Priority Continuous option, which locks the focus and the exposure at the first frame. The A7's regular continuous burst shooting can change the focus and exposure between frames but provides a slower rate of 2.5fps. 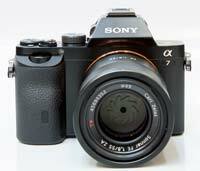 The A7R offers 1.5 FPS in the normal mode and 4 FPS in Speed Priority Mode. The Clear Image Zoom function effectively digitally doubles the zoom range of the attached lens, using Sony's new Pixel Super Resolution Technology to increase the magnification. The Auto Object Framing mode uses face detection and the rule of thirds to automatically crop and create more tightly framed shots. The same Pixel Super Resolution Technology ensures that the resulting image is still a full 36 megapixels in size, and the original uncropped image is also saved for easy comparison. Sony's long-standing D-Range Optimizer and HDR functions are present to help even out tricky exposures, for example where a bright background would normally throw the foreground into deep shadow. You can see from the examples on the Image Quality page that these features produce a photo with noticeably more dynamic range than one taken using one of the standard shooting modes, but at the same time without replicating the often "false" look of many HDR programs, and both offer a wide degree of customisation that's previously only been seen on Sony's DSLR/SLT range. Completing the top of the A7 is a second prominent dial for setting Exposure Compensation and a small button marked with C1, which as the name suggests can be customised to access one of the camera's key controls (it's handily set to Focus Mode by default). 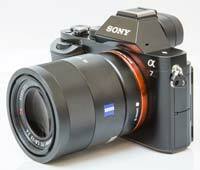 On the back, instead of the bulky optical viewfinder of a conventional DSLR, the Sony A7 has an electronic viewfinder. The OLED electronic viewfinder on the A7 is borrowed from the NEX-7 and NEX-6 compact system cameras and the A99 DSLR, and is simply excellent. It has a large 0.71x magnification, 100% field of view, and a staggeringly high 2,359,000 dot equivalent resolution, resulting in a display that's virtually indistinguishable from a more traditional optical viewfinder. As the EVF is reading the same signal from the image sensor as the rear LCD screen, it can also display similar information, with a choice of five display modes. For example, you can view and operate the A7's Function Menu, giving a true preview of the scene in front of you and quick access to all the key camera settings while it's held up to your eye. The various icons used to represent the camera settings are clear and legible. The icing on the viewing cake is the clever built-in eye sensor, which automatically switches on the viewfinder when you look into it, then switches it off and turns on the LCD monitor when you look away. The A7's EVF system also performs very well indoors in low light, typically the scourge of most EVFs which have to "gain-up" to produce a usable picture, resulting in a noticeably grainier picture. The A7 doesn't suffer from this unwanted effect at all, making its electronic viewfinder the equal of and in many areas better than a DSLR's optical viewfinder. The truest testament to the A7 is that we almost exclusively used it by holding it up to eye-level, something that we wouldn't do unless the EVF was of sufficient quality. There's also a large 3-inch, 921K-dot resolution LCD screen which can be tilted up to 45° downwards to shoot over crowds or up to 84° upwards and comfortably used outdoors even in harsh sunlight, although it can't be rotated to the side. Located above the screen and to either side of the EVF are the Menu and C2 buttons. Press the Menu button and a number of shooting and set up folders appear on screen, with white text on a black background aiding visibility. The seven shooting folders allow users to select image size, ratio and quality and - if JPEG (RAW and RAW+JPEG also available) - compression rates too, plus features like long exposure and high ISO noise reduction - all in fact activated as a default, and also contains the video quality and audio options, while the six Customise folders allow you to tweak the A7 to your way of working. Wi-fi, Apps, Playback, and Setup folders complete the long list of configurable options. By default the C2 button allows you to position the magnification point when manual focusing and zoom in by up to 14.4x, but as the name suggests it can be customised to another function. To the right is the chunky rear control dial and a useful one-touch movie record button embedded within the edge of the rubberised thumb-rest. Underneath is the combined AF/MF and Auto Exposure Lock (AEL) switch/button, and underneath that the Function button which accesses up to 12 customisable options that appear on in two horizontal columns along the bottom of the LCD screen. The Function menu proves to be a very handy way to quickly change the A7's key settings and one of the main ways of setting the camera to suit your shooting style. The traditional round navigation pad can be used to navigate through menus and options, in conjunction with the small button in the middle which activates whatever it is you've chosen. Three of the four directions on the navigation pad can also be customised to provide a quick way of setting various options. The navigation pad doubles up as a control ring that's used to navigate through and set menu options, and usefully also sets the ISO speed by default. The ring is a little small, but it's not too over-sensitive and the ability to take full control of the A7 is very welcome. In total the Sony A7r offers nine customisable buttons and 46 assignable functions, making it very easy to configure to suit your particular requirements. Underneath the navigation pad is the Playback button, which gives users the ability to dip in and out of created folders of images or the calendar view, view thumbnails, select slideshows and choose transitional effects and accompanying music, or delete shots. Press the shutter button halfway and you're helpfully catapulted back into capture mode. And that's basically it. With a press of the Menu button in playback, users have access to a few in-camera retouching effects, including the ability to crop and sharpen an image and apply red-eye correction. Completing the rear of the A7 is the self-explanatory Delete button, which doubles up as the customisable C3 button (accessing the wi-fi options by default). As denoted by symbols on the side of the camera, the Sony A7 is wi-fi and NFC capable and the functions can be adjusted in the Wi-fi main menu. You can choose to transmit the images to either a smartphone computer, or a compatible TV set. One cool feature of the wi-fi is being able to link the camera to your smart phone using the PlayMemories Mobile app. You can then use the phone as a remote so those outstretched arm 'selfies' will be a thing of the past. The A7 also features NFC (Near Field Communication) technology (the same technology that's used for mobile payments), which allows you to connect it to a compatible internet enabled device or another NFC-enabled camera by simply tapping them together. You can also use the WPS Push option to locate a hot spot, access settings, edit the device name, display the MAC address or format all settings if you wish. In addition to the built-in wi-fi/nfc connectivity, the A7 supports PlayMemories Camera Apps. As the name suggests, this is a downloadable service that lets you add new functionality to the camera, either via wi-fi or USB connection. Smart Remote Control, which allows you to control the exposure and shutter release via your smartphone, is preinstalled on the A7. Other optional apps available include Picture Effect+, Bracket Pro, Multi Frame NR, Photo Retouchand Direct Upload, and Sony plans to provide more new apps in the near future. Note that only some of the apps are free. 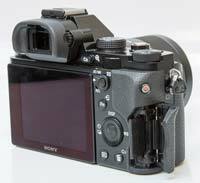 The bottom of the Sony A7 features a standard metal screw thread for attaching it to a tripod that's inline with the centre of the lens mount. A lockable plastic cover protects the lithium-ion battery, officially good for 270 shots. In practice we only got just 200 shots when using the electronic viewfinder and LCD screen, which obviously draw on the battery for power. Note that the camera battery is also inconveniently charged via the USB port, rather than a separate charger, so it's a very good idea to invest in some extra batteries. The removable memory card is housed within a compartment located on the right of the A7 (when viewed from the rear), with the A7 supporting the SD / SDHC / SDXC format in addition to Sony's own proprietary Pro Duo Memory Stick format. Positioned on both sides of the A7 are prominent metal eyelets for attaching the supplied shoulder strap. On the left are two unmarked, sturdy plastic covers, underneath which can be found the Multi port, HDMI port, and the external headphone and microphone connections.